The long-term trend for Arctic sea ice is inexorably down. Year-after-year, decade-after-decade, the human-driven accumulation of heat in the Arctic has taken a terrible toll. Recently, mid March through mid April showed record low sea ice extents for any period since record keeping began in 1979. Over the past two weeks, extent levels bounced back to around 4th to 6th lowest on record as winds shifted to north-to-south through the broad region between Greenland and the Kara Sea. For this region, melt pressure had been quite strong throughout Winter as a powerful warm flow of air flooded up from the North Atlantic. The shift, which has occurred coincident with upper-level winds running up from the Ridiculously Resilient Ridge in the Eastern Pacific, over Alaska and the Northwest Territories of Canada, into the Beaufort and on past the pole, has been pushing sea ice southward toward the Barents and into the Fram Strait. The result has been minor sea ice expansion in the near Greenland region at the cost of much more rapid melt in the Bering Sea, the Sea of Okhotsk and a very earl season break up of ice in the Beaufort. Overall, this Pacific-side warming of the Arctic has driven extent levels back down into the range of 3rd to 4th lowest on record for this time of year. And rapid melt in the Bering, the Sea of Okhost, together with warming in the Beaufort and Hudson Bay may result in new challenges to record lows over the coming days. Temperatures within the Beaufort Sea and near the Canadian Archipelago are still cold enough to support some re-freeze in the Polynya regions. However, closer to the Mackenzie Delta, temps have trended more and more toward near freezing or above freezing levels (sea water freezes at around 28 degrees Fahrenheit). The result is a rather large region with no new ice formation. As of 5 PM Eastern Standard time, temperatures in the Mackenzie Delta on the shores of the Beaufort Sea were pushing 32 degrees Fahrenheit. Meanwhile, 50 degree temperatures dominated the region of Great Slave Lake further upstream and southward. These readings are in the range of 8-15 degrees above normal for this time of year, resulting in an early melt pressure for the Mackenzie River and for coastal regions near the post-thaw river outflow zones. This warm pool is predicted to intensify through tomorrow with temperatures reaching the low 70s Fahrenheit (22 C) near Great Slave Lake and temperatures along Mackenzie Delta shores continuing to edge up over freezing. The warm pool will then linger for another few days before shifting east over Hudson Bay through early next week, pushing temperatures between 10 to 25 degrees Fahrenheit above normal there. By late next week, long range forecasts show another warm ridge extension through the Mackenzie Delta and melt pressure on the near-shore Beaufort re-intensifying. Overall, with Arctic Oscillation predicted to remain neutral, melt pressure in the Arctic would tend to reduce somewhat. 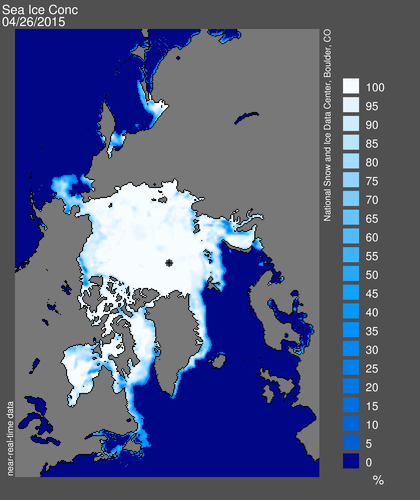 However, with both Bering and Okhotsk rapidly melting out and with warmth predicted to persist and intensify for those seas as well as for the Beaufort and for Hudson Bay, it appears there’s an even shot that early melt season will proceed at a more brisk than typical pace — again challenging new record lows into early May. It’s happened. An early-season Scandinavian heatwave has pushed above freezing temperatures all the way into the central Arctic. A powerful atmospheric blocking pattern that spawned record 80+ degree temperatures in Scandinavia this weekend has elongated, stretching all the way into the central Arctic. As the bulge increased in amplitude, it brought warmer air with it. 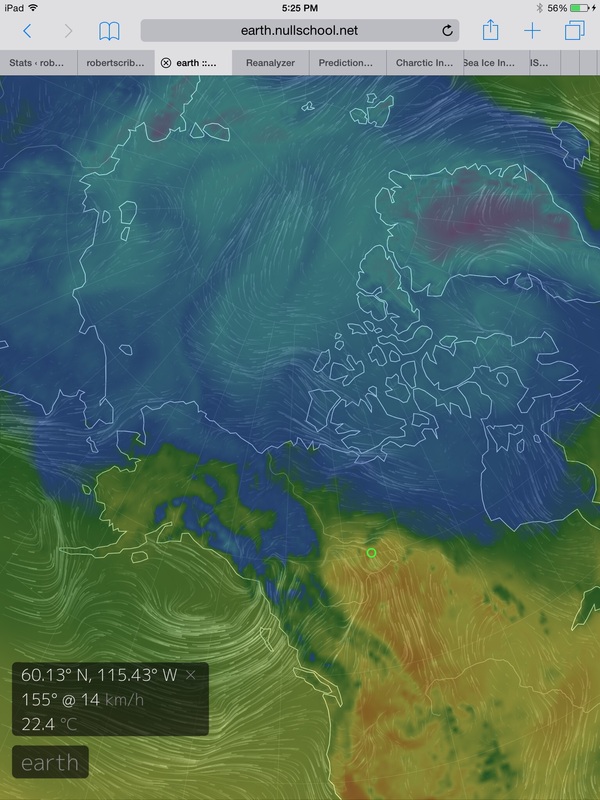 Temperatures at the North Pole over the past week ranged from 5-10 degrees Fahrenheit. Now, we are seeing temps around 33 degrees, a range of ‘warmth’ usually reserved for mid summer. This pulse of warmer air is now riding over regions where sea ice was thinned by a persistent, moderate-strength Arctic cyclone that lasted for about a week. 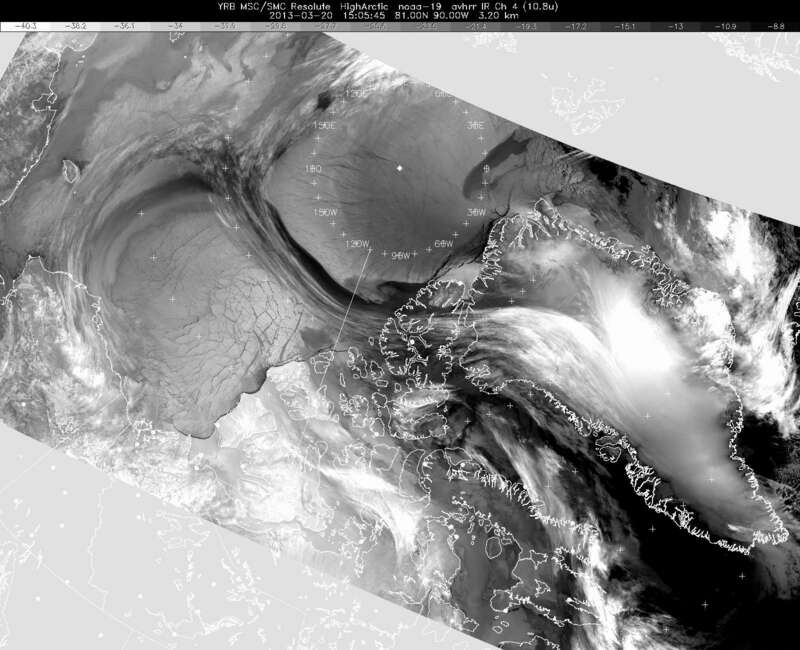 The cyclone churned and dispersed the ice, causing large cracks to form even in a region very close to the North Pole. The freezing point of sea water is about 29 degrees Fahrenheit, so we’ll have to see if this warmer air combined with near constant sunlight has any further melting effect (see The Big Thin Begins to learn more about this event). Particularly interesting is that 40 degree F reading on the northeastern tip of Greenland. But the high 30s and low 40s blanket Svalbard as well. Weather forecast model maps show this pulse of warm air persisting through tomorrow. Then colder air returns along with stormier weather. A related feature is the persistent cyclone that chewed away at the central ice for much of last week. It has now transitioned to the Beaufort Sea where it appears to be strengthening. Intensification is expected to continue through tomorrow. Then, the cyclone is projected to swing back to the Central Arctic by late Tuesday, apparently feeding on warmer, moister air as it intensifies to a 980-985 mb low by early Wednesday. Longer range forecasts show the cyclone persisting as it continues its strange dance around the Central Arctic. We’ll have to watch the ice pack for further breakage and fracture from these two events. A continued thinning of the central ice so early in the year would be unprecedented. Yet it seems possible enough to continue monitoring. 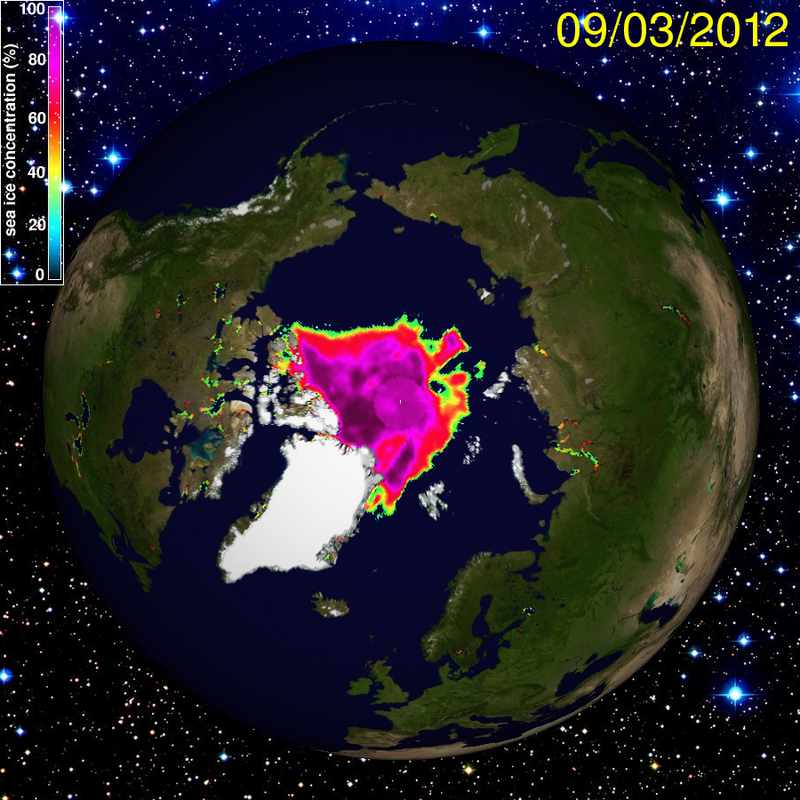 Neven, over at the Arctic Ice Blog, has tentatively called a beginning to the Arctic sea ice melt season. Neven notes that sea ice area according to Cryosphere Today reached maximum on February 27th and sea ice extent, according to IJIS reached maximum on March 15th. It may be a bit early to say with complete assurance that the melt season has begun. But indicators do appear to be in line with Neven’s estimate. 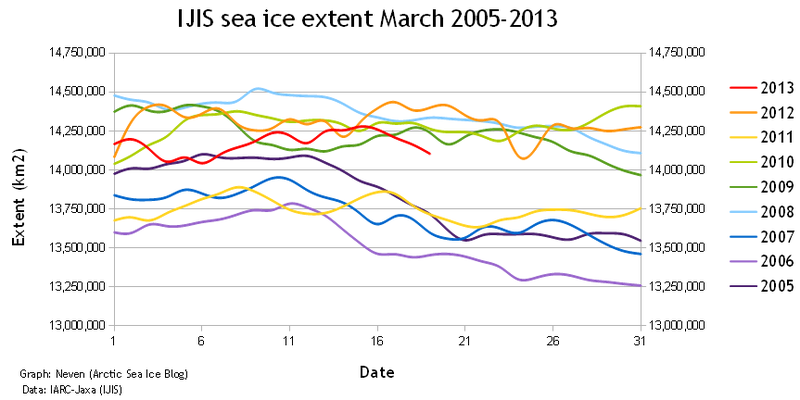 All measures for extent and area are now showing the sea ice to be in slow decline. Further, powerful blocking patterns over Greenland and Eastern Siberia continue pumping warm air into the Arctic even as they assault the central and northern US with continued wintery weather. As we can see in the image below, temperatures are well above normal in the Arctic for this time of year. Hotter than usual temperatures have settled over all of the Arctic with a particularly warm area hovering over Baffin Bay. These high temperatures combine with a powerful Arctic high pressure system and strong negative Arctic Oscillation to aid in sea ice erosion at the edges while stressing the central ice even as the sun begins to lift above the Arctic Circle. Greenland is again gathering more heat energy than is usual for this time of year, with the current blocking pattern established directly over its western half. NSIDC has already noted a number of melt days for the south-east coast of Greenland and was forced to recalibrate their melt model early due to the winter emergence of heat baked into the ice sheet from last summer. This event resulted in both residual melt and higher ice-sheet temperatures. The high pressure system currently dominating the Arctic provides very clear skies over much of the region. So we can see directly down to the ice pack. 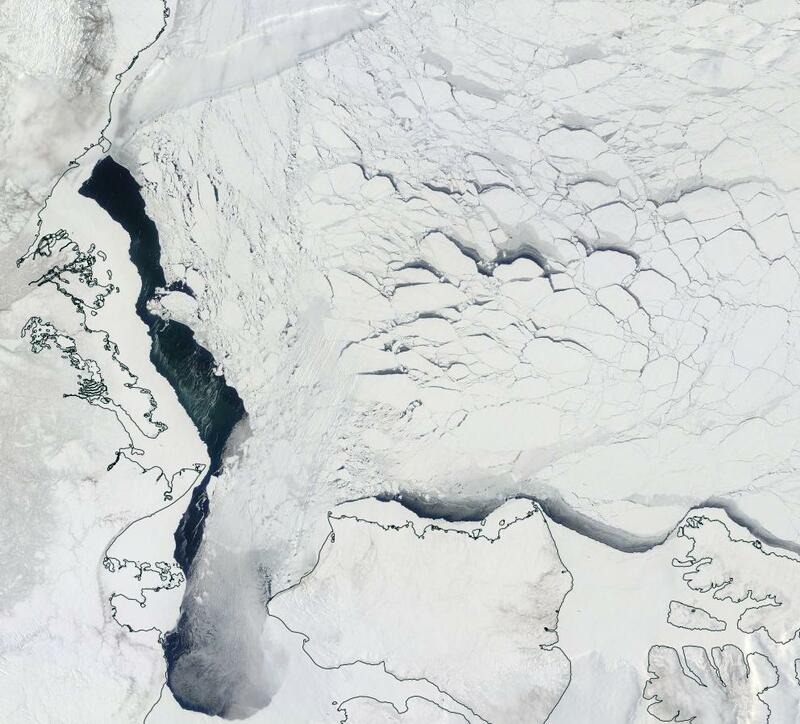 There, the Beaufort Sea displays extraordinarily extensive cracking. To the north and east, a thin line of cloud pushed up by warmer air to the south obscures a small section of the ice. But beyond that we see a region around the North Pole also displaying large and expanding cracks. All of this — the cracking, the abnormal heat, the early Greenland melt and left over heat from last summer, would seem to mark a rather ominous start to the 2013 melt season. Today Arctic sea ice measurements showed a new low for area at 2.37 million square kilometers, 533,000 square kilometers below the record low set last year. Sea ice extent remained stable, holding near its new record low of 3.68 million square kilometers for JAXA and 3.54 million square kilometers for NSIDC. Based on satellite observation, it appears that ice has spread slightly even as it thinned and new holes opened up, suggesting weather conditions consolidating the ice sheet have relaxed somewhat. Melt rates have leveled off a bit over the past few days. If this slowing continues, we may finally see the natural abatement that leads up to the end of a typical melt season. Currently, such a call is too early to make, but it does appear possible. By all measures this is a crash year likely second only to 2007. It is part of a much larger trend of sea ice decline that started at the beginning of the 20th century and has accelerated since the 1970s, reaching a particularly rapid pace over the past 10 years. There has been lots of chatter over the cryo blogosphere today about potentials for future melt and the reasons this melt season happened. In short, it’s the record melt that shouldn’t have been. All other things being normal, we would have seen the recovery climate change deniers kept pointing toward. But all other things are clearly not normal and a number of people are doing their best to expose the underlying trends. You can read Chris’s full blog on the subject here. It is these underlying volume losses that set the stage for this year’s large sea ice area and extent losses. It is also valid proof that global warming forcings have reached a point that is not allowing the Arctic sea ice to recover.